(Albuquerque, NM) The tenth annual UNM Business Plan Competition took place at the Anderson School of Management on March 27. The twenty teams in the university-wide competition presented their plans to over forty experienced venture capitalists, angel investors, and experienced entrepreneurs who selected three prize-winning business proposals for both the Technology Ventures and Entrepreneurial Ventures tracks. The winning teams were announced at the Awards Reception and Banquet at the Crowne Plaza Albuquerque. $75,000 in total prize funds were awarded to the aspiring entrepreneurs for start-up funding. Dr. Sul Kassicieh, Distinguished Professor at Anderson School of Management and Director of the UNM Business Plan Competition said, "As the UNM Business Plan Competition celebrates its tenth anniversary this year, we want to express our gratitude to the business community of New Mexico. The supporters of the competition have donated over $1.5 million for this eco-system to thrive as well as many hours mentoring the teams, judging the competition and providing follow-on advice to the businesses that get started as a result. To all of our supporters, we say 'thanks'." The competition encourages student teams from all UNM schools to utilize the wealth of technological innovations developed in New Mexico federal laboratories and universities. Technology Ventures teams utilize technology from Sandia and Los Alamos National Laboratories, from STC.UNM, or their own source with which to create a new business venture. Entrepreneurial teams create new small firms in business not involving intellectual property. 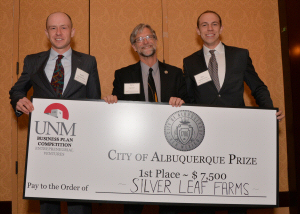 Next year's competition will take place on April 8, 2016, and will lead the UNM Business Plan Competition into a second decade of developing UNM students into local entrepreneurs. Twist Resist is a patent pending rotational exercise machine which allows the user to target a number of areas of the musculature structure of the body, which were previously very difficult to target. BlocVenue is a web platform that will connect landowners/homeowners with users who wish to rent backyards and lots for different events such as weddings, barbecues and much more. Obvious Engineering seeks to bring the tools and equipment of wild land firefighting into the 21st century. Fight fire smarter, not harder. 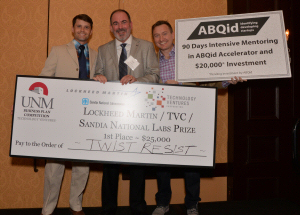 The judges also awarded the ABQid prize to Twist Resist. The prize consists of 90 days intensive mentoring in ABQid Accelerator and a $20,000 investment (pending investment from ABQid). Original Beverage Company celebrates America and the American West with its line of straight whiskeys. OBC is a start-up producer in a distilled industry dominated by large producers. Wyrdos disrupts the video hosting industry by providing an innovative platform, and fostering a great community. For complete competition details please visit https://bizplan.unm.edu or contact Alberto Sol�s at 277-6172 or albertos@unm.edu.